Synopsis: The most important asset of any university or college is its staff, yet the majority of line managers in higher education institutions are not appointed on the basis of their experience of, or expertise in, managing people. This book is a practical guide to people management for these managers. With contributions from Professor Robin Middlehurst, Tom Kennie and Catherine Simm, Alison Hall guides readers through the employment cycle, from recruitment to parting company, addressing en route those issues that cause line managers to lose most sleep. Illustrated throughout with case studies and examples of best practice, the book provides a guide to: effective (and legal) recruitment and selection managing the crucial early days of an appointment leadership, team-building, measuring performance and appraisal managing tricky situations such as sickness absence, discipline, stress, harassment and grievances handling the end of an employment relationship fairly. 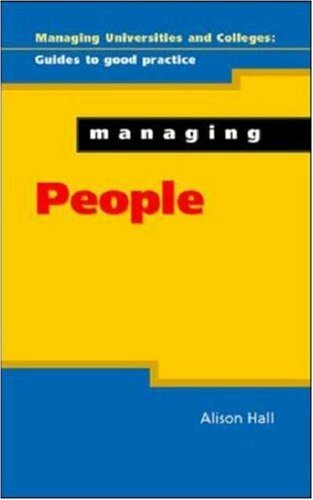 "Managing People" will be essential reading for HE managers, staff in Human Resource departments, consultants and students and staff involved in HR courses. About the Author&colon; ALISON HALL has worked in personnel since 1989 and is currently Deputy Head of Personnel at the University of Leicester. She has had extensive experience of advising managers in universities on people management issues as well as industrial relations experience, including a secondment to the Universities and Colleges Employers Association. Her publications include 'Personnel Management' in 'Higher Education Management - The Key Elements" (eds Warner and Palfreyman, 1996) TOM KENNIE is a director of the Ranmore Consulting Group. He has extensive experience of senior level management development in higher education institutions. With Robin Middlehurst he co-directs the Top Management Programme for Higher education. he is also a Visiting professor at Sheffield Hallam University and an Adjunct Professor at the University of Technology Sydney. ROBIN MIDDLEHURST is a Professor of Higher Education at the University of Surrey and Head of a Centre for Policy and Change in Tertiary Education. Her current research includes work on Borderless Higher Education, leadership Development in Higher Education and Quality in Transnational Tertiary Education. With Tom Kennie, she co-directs the Top Management Programme for Higher Education and is acting as a consultant to UUK and SCOP in establishing a Leadership Foundation for UK HE. She has wide experience of policy developments in higher education nationally and globally. CATHERINE SIMM gained a Bsc (Hons) in Psychology and Business Administration at Aston University in 1996. She then went on to do a Post Graduate Diploma in Personal Management at Leeds Metropolitan University and a MA in Human Resource management at De Montfort University. She has seven years experience working as a personal practitioner in both pre- and post- 1992 universities and has also spent some time in local government roles. She now works as a HR Consultant for Capita, a public-private partnership providing HR services to a local authority. She is a member of the Chartered Institute of Personnel and Development.